The face is our greeting card, and it is imperative that we always take good care of it. Achieve a well-cleansed, hydrated, spotless and acne-free complexion with Ervamatin Skin Line. All Ervamatin products are 100% natural, and thus have no side effects. Use the power of nature to your advantage. 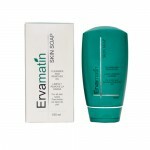 Care for your face skin with Ervamatin Skin Soap and Skin Clear today!